Okay! So the goal here is to get a Mew on your Virtual Console game (Red/Blue/Yellow VC). 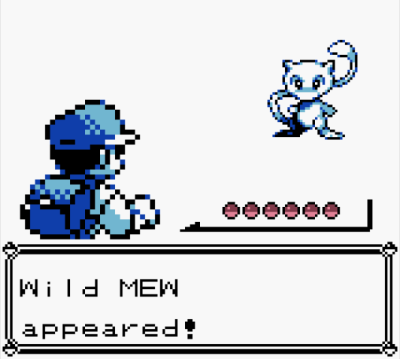 While this is something that many casual players have learned to do, we want to get an original Kanto Mew that passes through the Pokemon Bank. Only one Mew OT/ID combination will pass through. While your OT is easy to manipulate (just named yourself the OT at the start of your game) it's the ID number that will throw you for a loop. However, players have found a way to glitch an item called 8F into your game that can manipulate the trainer ID number based on the sequence and number of items in your inventory. Before we start, just note that using and even getting the item 8F can (but probably won't as long as you stick to the directions) mess up your save file permanently, so use at your own risk. other locations for the Mew glitch. it's almost easier to find a trainer with a last Pokemon with 21 Special. you're stepping into his sight. You'll know you did it right if the menu opens as you step down. animation starts and the menu does not open, soft reset your game and try again until it works. you will have completed the easy part! Also note, this method can be used to get other Pokemon, like Mr. Mime and Jynx, in the "wild"
that would otherwise only be obtained through in-game trades. Nifty. 128 to the 6th item in your inventory. This is important for adding mass items you will need. The max item amount is 256, so keep this in mind so that you don't add too many items. it will help determine how 8F will operate. This will need to be exact in this party order. off in battles so that it's 233 currently. be in Box 1 Slot 1 of your PC. SAVE YOUR GAME PLEASE. the exact spot shown here for the glitch to work properly. Now open you menu and let's begin. item (originally Item #2) and you now have three sets of X Special x 255.
the second set. This will result in your inventory having one X Special followed by 255 X Special. Switch the placement of these two sets and it will result in only one item set, X Special x0. exit out of your menu. following inventory of items. 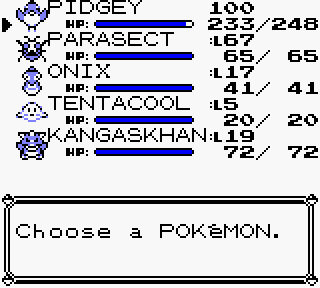 JUST REMEMBER that Missingno will add 128 to the 6th item. prepare the following item list and then save before we go further. the Missingno glitch. You will also need to have TM21 in your PC box ready to go. With all that out of the way, and Mew in the 1st slot of your PC, let's get started. Use 8F for a fourth time. And use 8F for the fifth and final time. 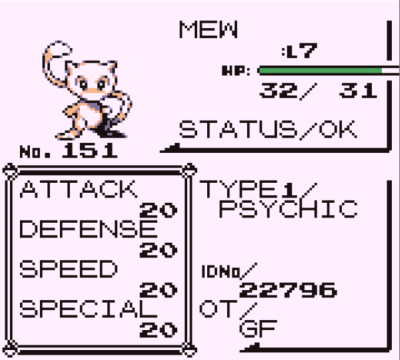 Now the moment of truth... Go to your PC Box and check on the Mew you had in there. and you can transfer this Mew up to Gen 7 using Poke Transporter! CONGRATS!